Walking into Tucker’s Restaurant on Vine Street in OTR is like walking into a friend’s kitchen and finding the whole neighborhood came there with you. And, in a neighborhood like Over-the-Rhine, getting the whole neighborhood together is no small feat. The Tucker family opened their first diner on 13th Street in 1946. They were open seven days a week, 24 hours a day. 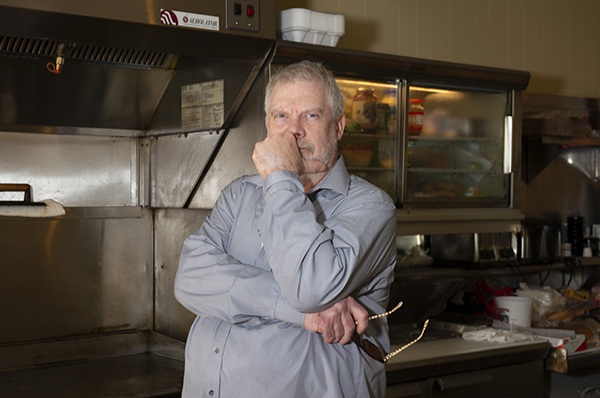 At one time, the family had three restaurants operating in the downtown area but now the diner on Vine Street, operated by second-generation owner Joe Tucker and his wife Carla, is the last remaining. And to call it “beloved” to the neighborhood is an understatement. Unlike some of the newer restaurants nearby, there is nothing particularly refined about Tucker’s. The culture of the place feels vintage, yet familiar: a counter by the grill and a few booths, with a prep kitchen in the back. Décor is sparse; the register is up by the door. They use Smucker’s jelly and Swiss Miss hot cocoa; the coffee beans come from a can and the mugs don’t match. The menu at Tucker’s is basic breakfast and lunch fare with specials rotating through. The food is really good and prices are still fairly low, making it affordable for the neighborhood’s economically diverse customer base. Yet, the menu can still appeal Over-the-Rhine’s characteristic artistic flare. In the 1980’s, for example, when Main Street saw an influx of artists and college students the Tuckers added some vegetarian options to the menu and they’re still some of the most popular. Customers walk in and order without even looking at the menu and the Tuckers don’t need to write the orders down. Joe, and his wife Carla have operated the diner on Vine St for 40 years. They work side-by-side taking orders, preparing to-go bags, manning the grill. She never intended to make a life as a restaurateur, but she married into the family business. “Love makes you do crazy things,” she says. And she doesn’t seem to mind. Joe Tucker, co-owner of Tucker's RestaurantJoe’s father, “E.G.” Tucker has been gone since 2003 and the matriarch of the family, Maynie, passed away only a few months ago. A surrogate mother and grandmother to so many in the neighborhood, her passing was hard. To their customers, the Tuckers are family. This, Joe Tucker says, is what keeps people coming back. He’s right. Sitting at the counter is like hearing the oral history of the neighborhood. As each customer walks in, the Tuckers greet them all like family. They share stories and news. Some of the customers, they say, have been coming in for three and four generations. Some of them came in when they were young and needed help with their homework after school. No one is turned away; everyone is welcomed. In 2015, a fire broke out in the prep kitchen and destroyed everything. It was the neighborhood that rallied to bring it back to life. A fundraising campaign was launched and neighbors raised money (and offered free services) to restore the restaurant. They reopened a year later, in 2016. The Tucker family has seen OTR through decades of changes. The gentrification, Joe Tucker says, has been hard on them. But the restaurant itself remains relatively unchanged. In fact, the architect who was hired to reconstruct Tucker’s after the fire was told to bring it up to code, but keep things exactly the same as they were before. It’s not only neighbors, either. Tucker’s draws customers from all over Cincinnati and the region. It also attracts attention from non-locals due to various nods from food and dining magazines and stellar online reviews. Tucker’s Restaurant is at 1637 Vine Street in Over-the-Rhine. Hours vary by day and they are closed on Mondays. Free parking can be found in a lot across the street on the weekends only. It is serviced by the Cincinnati Bell Connector’s Findlay Market - Race Station stop and Metro Buses 78, 46, 21, 64, 16, 17.